During the writing of this book I’ve thought a lot about heroes – who gets to be one and who doesn’t, whose story gets told and whose doesn’t. We’ve come across so many amazing stories that will only be told in passing or in footnotes in our book. Like this one. In 1815, Big Bear, the Headman of the mountain Cherokees, wrote a letter to President James Madison asking for someone who knew their regional issues and needs to be assigned as their federal agent. Reasonable request, right? Madison never answered it. So in January of 1816, he and the other chiefs wrote another letter. To ensure Madison received it, they got two men, Roman Nose and Junaluska, to volunteer to hand deliver it. 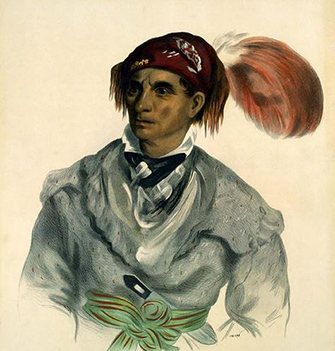 Roman Nose was a local headman and Junaluska was a seriously badass warrior who had saved Andrew Jackson’s bacon (and maybe his life) during the battle of Horseshoe Bend! Think about what those two men did and how they did it. This trip – in JANUARY, from the mountains of North Carolina to Washington DC – was 500 miles each way. On horseback it would have taken a *minimum* of 20 days to get to Washington. I say on horseback, rather than by coach, because it’s likely they weren’t welcomed on stage coaches, as well as at many taverns along the way. Most white people were terrified of Indians at that time (which meant the two men were also in danger of being attacked). Where did they sleep? In fields? By the side of the road? Where and what did they eat? And did I mention that this was in January? And when they got to Washington, how would they have been received? People did pop in and out of the White House back then. But what happened when two Cherokee men marched up to the front door of the White House and said, “We have a letter for President Madison.” Imagine the butler or maid’s face when they said, “No, we won’t just leave it with you. We have to give it to HIM ourselves.” I like to think of them marching into the White House, into the Oval Office maybe, and handing him that letter they’d come 500 miles to deliver. Now those are some heroes! By the way, Madison didn’t answer that letter either. And so began the deadliest war fought in the continental U.S., on the grand principle of… absolute and unalterable white supremacy. But if you want a frivolous but fun little exercise, read on. Today, in a fit of annoyance, I decided to replace all the “brave settler” language with historically accurate terms and descriptions. The result was both silly and yet deeply satisfying. So here’s a recap of some of the most common “brave settler” vocabulary with my replacement term. HOO BOY! There’s a lot going on today and every day lately- and mostly I’m trying to hunker down and get as much writing done as possible. But this Laura Ingalls Wilder controversy (her name is being stripped from a prestigeous literary prize because of racial language and stereotypes) goes straight to the heart of what I’m writing about now – colonialism, its offshoot Manifest Destiny, their hierarchical view of both people and land use, and the linkage of all those things to white supremacy. 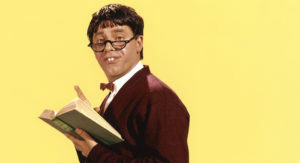 Ingalls wrote that the character “Pa” wanted to go where “there were no people. Only Indians lived there.” Ouch. But that bald, painful sentence goes right to the heart of the resettlement of North America by white Anglo-Europeans. “There were no people. Only Indians.” That’s a myth that is still active. 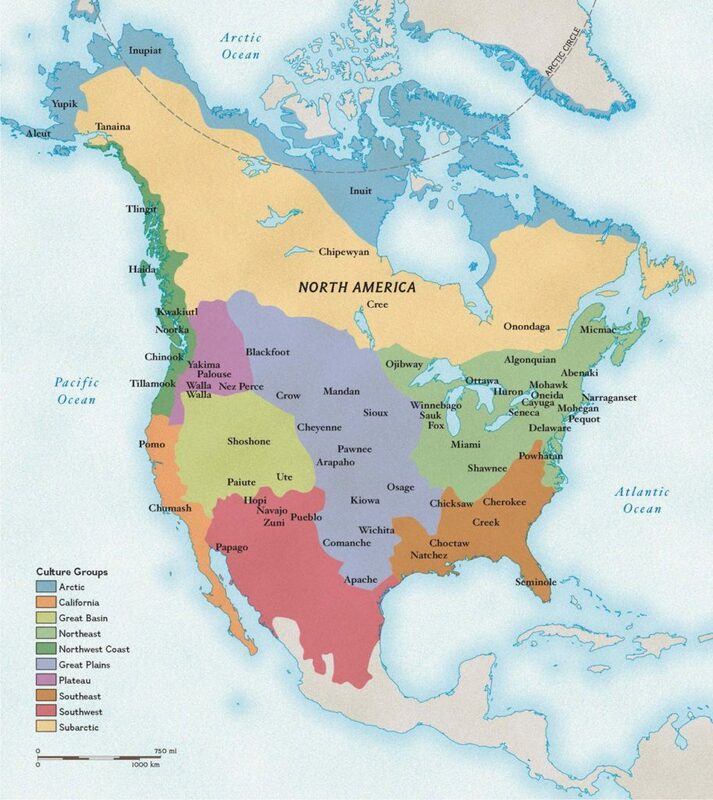 I have been told, within the last six months, that America was “empty” when the settlers got here or that our ancestors took land that no one was using. The truth is that the land was very much in use, but in ways that colonizing whites could not “see” – by which I mean they did not see it as of any value. Land was hunted and farmed communally; fields were left intentionally fallow to regain fertility, complex ecosystems were stewarded to the benefit of the group. The colonizers, on the other hand, were part of centralized states that needed bounded, taxable land in order to generate revenue through taxes. Communal land can’t be enumerated and taxed, just as hunted or foraged food can’t be easily counted and taxed. By the way, this isn’t directly about whiteness. This was the pattern when the English colonized Scotland and Ireland and it continued in North America. It’s not about “whiteness,” but it is about hierarchies of who and what is valued. Land use customs originally defined it, but skin color became inextricably bound up with it, and through that colonization became a tool of white supremacy. So what about Laura Ingalls Wilder? What do we do with these parts of our culture – books that use racial epithets to describe groups of people; monuments that lament the South’s loss of the Civil War; or even words like “boy,” “cotton-picking,” “pickaninny” that were once used without thought by whites and are now understood to be racist? Many people say that we “shouldn’t erase our history.” But that’s the problem; it’s OUR version of American history, but it’s not necessarily theirs – whoever “they” might be. And, all too often, “our” history erases “their” history. Laura Ingalls Wilder isn’t, by the way, being banned or erased. She’s just not going to have a prestigious literary award named after her any longer. Her books, thought problems and all, will still be on the shelves of your local library. Children will still read them and dream. But we, as a nation, do need to reckon with what we did: we did not “settle” an empty land, we took land from people who were actively using it. What we saw as pristine forests with no troublesome undergrowth, were actually territorial hunting grounds the Native population had carefully stewarded with controlled burns so they could hunt more easily. Some of my family say we need to give up “white guilt,” and you know what? I agree. But I mean it differently. I mean we have to stop passing on the stories we’ve used to make ourselves feel better. Many of these are stories my beloved mother told me, and that her mother told her – that our ancestors were the “good masters,” that “a lot of slaves were happy,” that the Civil War wasn’t about slavery, or that the land was empty when we got here. We need to accept the truth of what we as a nation have done, good and bad. It’s the only way we can move on to the future. Some myths – those that have been turned into literal monuments, do need to be reevaluated honestly by the communities they exist within. Some of them will be removed, some will remain. Laura Ingalls Wilder and her myth of a land that was empty – because the Indians who lived there weren’t “people” – can and should stay on the shelf. But the myth she romanticized so compellingly – the myth of an empty America waiting for white settlers to take it – does need to be questioned. Literature is complex and imperfect, just like the people who create it. We should allow it to be so – by critiquing what is untrue or wrongheaded while valuing skill and artistry, and the joy they give us. Laura Ingalls Wilder will not be hurt by the stripping away of her name from a prize. And her readers, those dreamy little boys and girls, wandering along the shelves of their public libraries, looking for worlds to escape into, certainly don’t care. 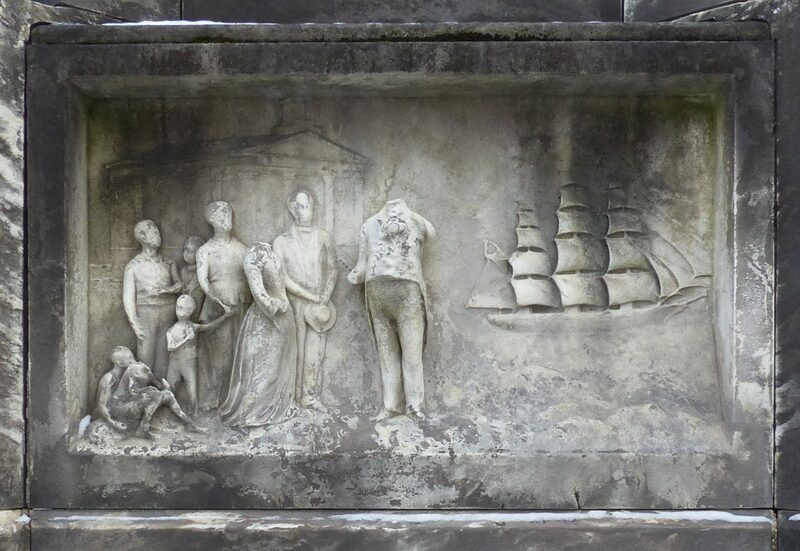 Marble panel from the Charles Avery tomb, Allegheny Cemetery, Pittsburgh, PA, 1860, showing a black family on the left, and a ship departing for Liberia on the right. Avery was a prominent funder of the American Colonization Society which sent thousands of newly freed people to the African colony in the decades before the Civil War. As we’ve delved into the complex racial and social history of whites, Cherokees, and blacks in western North Carolina, we’ve come across many amazing individual stories that we can’t include in the book (unless we want it to be seven volumes!). But these stories have a lot to tell us about the complexities of race in America. A trope that will be familiar to anyone who’s confronted a personal history of being descended from either the enslavers or the enslaved, is the myth of the “good slave owner.” Many white people – many in our own families – cling desperately to any evidence that their ancestors were “good,” or at least better than those other enslavers. Some use wills freeing the enslaved on certain conditions as evidence of the goodness of their ancestors. But in addition to the indefensible fact that these wills continue to enslave people until the owner’s death, they show us ways in which racism hides in such seemingly magnanimous gestures. One such will was left by one of Will Thomas’s distant cousins, a man by the name of John Berry of Lincoln County. Berry was a farmer and blacksmith who owned several valuable tracts of land and two black people, named Tom and Debby. In his January 1833 will, Berry gave Tom and Debby a choice: after his death they could either remain in North Carolina enslaved, but to a master of their choice, or they could choose to be free, but only if they were willing to emigrate to Liberia – which meant giving up everything and everyone they knew, and taking a dangerous sea voyage to an entirely unfamiliar land. It’s true that there were draconian manumission laws in effect at the time, making it difficult to simply free a person. Manumission became much more difficult in North Carolina after 1830, when the state legislature required owners to provide support for newly freed people and required the new freedmen to leave the state within 90 days. But it must be also understood that the group encouraging black emigration to Liberia – the American Colonization Society – was founded on ideas of racial purity and against race mixing. Berry’s will was an early example of this manumission-and-deportation scheme. Eventually over 2,000 brave North Carolinians of African descent would choose to make the transatlantic voyage to Liberia, assisted by the Colonization Society. Tom chose to remain in North Carolina, probably to remain with people he loved. We don’t know who he chose to be his master or what his fate was. John Berry’s will bequeathed him a set of cooper’s tools (for barrel-making), suggesting that he was a skilled tradesman. One can only hope he was able to hire himself out and earn the money to purchase his and his family’s freedom. It was an extraordinary act of courage, for a single woman to embark on such a perilous journey into an unknown future — a testament to her determination to do whatever it took to be rid of slavery. This document is the last trace we have been able to find of her. We don’t know whether she completed the journey, much less how she may have fared in her new home. A white descendant of Berry’s, reading the will, might be tempted to ascribe goodness to Berry. But in circumstances like enslavement, “good” is an absolute term. To believe you can “own” another person is the negation of all that is good. We can say there were better or worse enslavers, but there could never be a truly good one; the only way to be a good enslaver would be to free the slaves immediately and without conditions. Berry was among the “better” masters, but one must recognize that even in making that better choice, he chose not to inconvenience himself in life, either in the loss of their service to him, or in giving them better, more bearable choices. Any goodness in this situation can only be attached to the people he enslaved contending with the heart-rending choice they were given. One chose the pain of remaining enslaved, but with people he loved in a world he knew. One chose freedom at the cost of everything and everything she knew. Both were heroically brave. Berry’s will can be seen in the original on FamilySearch. 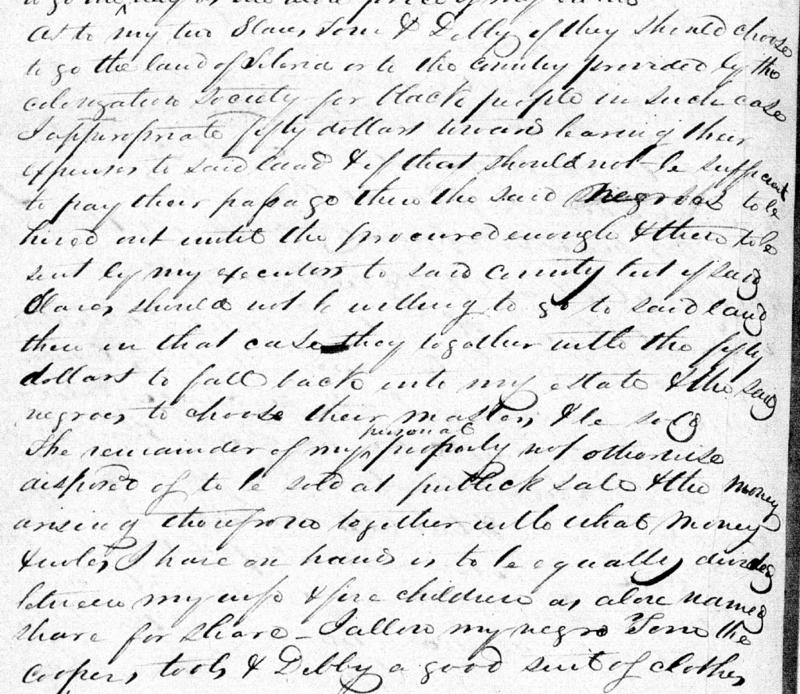 His full estate file with the expense sheet (and an 1829 bill for a “cupping” treatment that he and Debby both received) is also on FamilySearch. We also recommend a book on black emigration from North Carolina to Liberia by Claude Andrew Clegg III, The Price of Liberty: African Americans and the Making of Liberia (UNC Press, 2009). As the family story keeper – the one who receives and passes on family tales – I have always been fascinated with the moments when the story doesn’t quite add up – the jump in the film, the glitch in the Matrix. I remember, as a kid, annoying my mother repeatedly by interrupting her and saying, “But Mama, that doesn’t make any sense!” I’m still at it. And what I’ve learned from researching this book is that the moment where the story jumps is also where that treasure called the truth lies. Because that is what your people are afraid of facing and that is often who they really are. In my family history, we seem to emerge, like Athena from Zeus’s head, full grown in the 18th century as well-to-do frontier gentry using the term “Scotch-Irish” to cover over a multitude of things – some of them sins, but and some of them just the hard-scrabble white-trash history of who we were before we became the cultured educated people we are now. In our family history, my fourth great grandfather, Robert Love, is remembered as a well-to-do member of the elite. He was the “founder” of the town of Waynesville, NC and donated the land for the Haywood County courthouse. Within the family we remember proudly that the Loves brought the first piano into western NC. We are founders, we are cultured, and how we got to be those things is not examined. I think often of those two sixteen-year-old boys: one watching the cruel and unprovoked destruction of his home, the sacred mother town of Kituwah, from the hillside above it; the other somewhere below, lighting a match, holding a gun, destroying a world. That is the moment where my family history became inextricably tangled with the history of the mountain Cherokee. Yonaguska, the helpless witness of white destruction, would go on to become a “peace chief” – one who eschewed violence and pursued negotiation. He would also lead the only successful resistance to the Trail of Tears. The tactics he used were those he used on that day – withdrawing deeper into the mountains, camouflage, evasion. Some of it done with the help of a young white boy named Will Thomas that he later adopted as a son. Robert Love would move to “pacified” territory in Western North Carolina, become a merchant, slave owner, and a wealthy man. He would mentor a young man named Will Thomas, just starting out his life as a merchant. They were deeply involved in each other’s lives. Robert Love chose Will, who was exceptionally personable and capable, above his own sons, to be executor of his estate. Will, taking the tactics he’d learned from his adopted father, used charm and evasion to persuade Robert to write letters attesting to the harmlessness of the local Cherokee to legislators who were trying to oust them. I like to imagine this too: Will saying, “Oh, don’t worry, they’ll leave eventually. 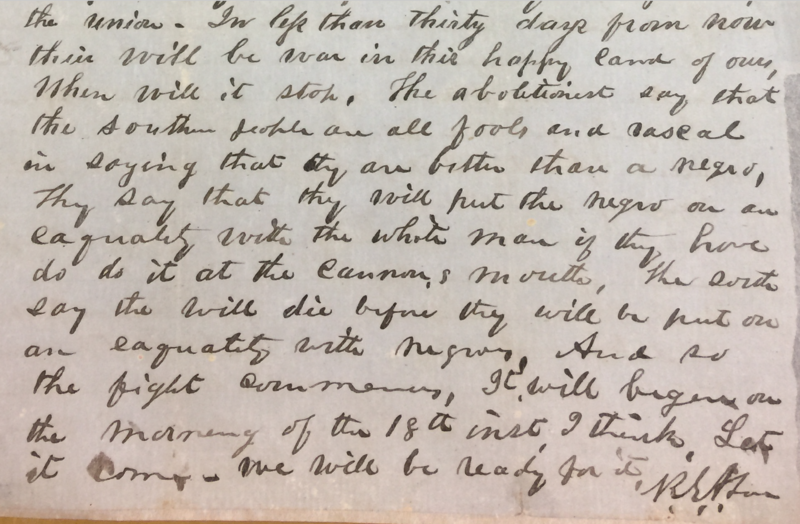 They’re just not quite ready to do it now.” And Robert, wanting to please the young man, writing to his friends in the legislature that the Cherokee were very civilized now, model citizens, and would no doubt join their people in Oklahoma … eventually. And so, Yonaguska, who watched his world burn and learned from it, and exacted justice from the young wagoner who helped burn it. Later Yonaguska’s devoted white son would marry Robert Love’s young granddaughter. The mingled descendants of these men would choose to erase this part of the story. They’d focus on Robert Love’s wealth, Will Thomas’s heroism helping “those poor Cherokee.” But there would be a jump in the record, a glitch in the story, discernible to anyone, willing to look hard. And as one who always chooses to take the red pill, go down the rabbit hole, unravel the comfortable lie and see how far the uncomfortable story goes, I want to urge any of you who are willing and interested to do the same. You might not love what you find, but I guarantee you that you’ll know yourself, your family, and your nation better. And the ride is wilder than any rollercoaster and incredibly fun! Go ahead, take the red pill. And then I’d tell them that I’m feeling shaky about whether or not I’m up to this task. They’d all nod supportively and murmur encouragement. I’d sit down and someone else would come up to the front of the room and admit their struggle with moronic assumptions and I would feel better about the fact that now I have to go back and totally rewrite chapter four, just when I thought I was done revising it. Maybe I could even have a sponsor I could call at two in the morning when I felt an uncontrollable urge to relapse into my old comfy and intellectually sloppy white-person assumptions. But, seriously, unlearning everything I thought I knew, and getting Kirk to unlearn all those years of believing in the sanctity of documents created by white people, has been the hardest thing we’ve had to do. I’ve always prided myself in not buying into my family’s white, Southern narratives. But working on this project I have had more I can’t believe I didn’t SEE that before! moments than I would have thought possible. My Scotch-Irish ancestors weren’t “fiercely independent” pioneers who wanted to replicate their lives in the mountains of Scotland and Ireland. They were people who had been ethnically cleansed, multiply displaced, and in North America were simply desperate for any land anywhere. 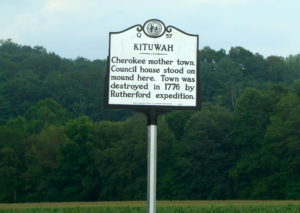 The North Carolina Cherokee weren’t saved by my great-great grandfather. They were a collectively governed group who decided, with their chief, to save themselves. My great-great grandfather helped them with their plan and was the interface between them and the white legal system. Anyway, I’d like to think that every one of us is some kind of recovering moron – whether we’re recovering from gender, race, or colonialist assumptions – and that if we take it day by day, page by page, we can overcome our addiction to safe, unexamined assumptions. And if we are tempted to fall off the wagon, we can always turn to that higher power, people who are part of the dispossessed group we’re trying to write not-stupidly about. 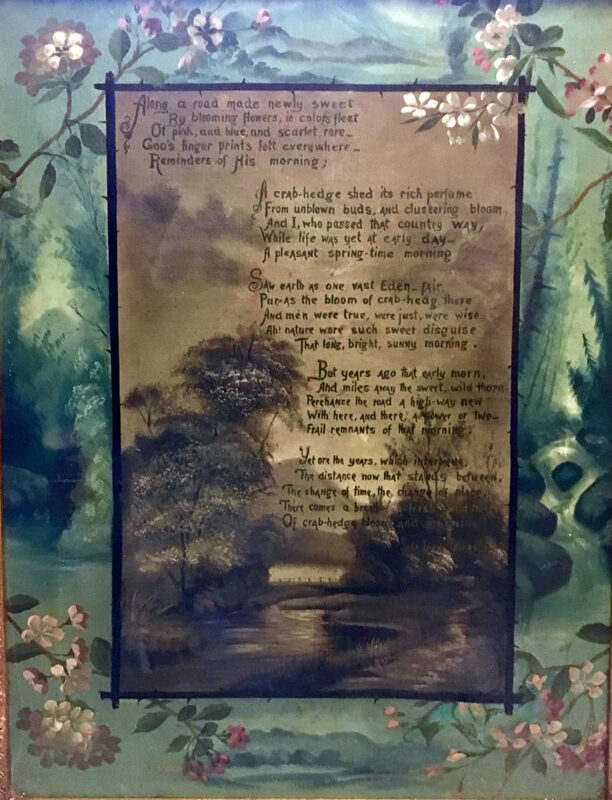 In the first years of the 19th century a Scotch-Irishman named John Hyde settled on the Oconalufty River very near where the Oconaluftee Visitors Center to the Great Smoky Mountains National Park stands today. He’d bought the property from a speculator, Felix Walker, who was locked in an epic lawsuit with Elizabeth’s 4xggrandfather Waightstill Avery over who had better title to the land. 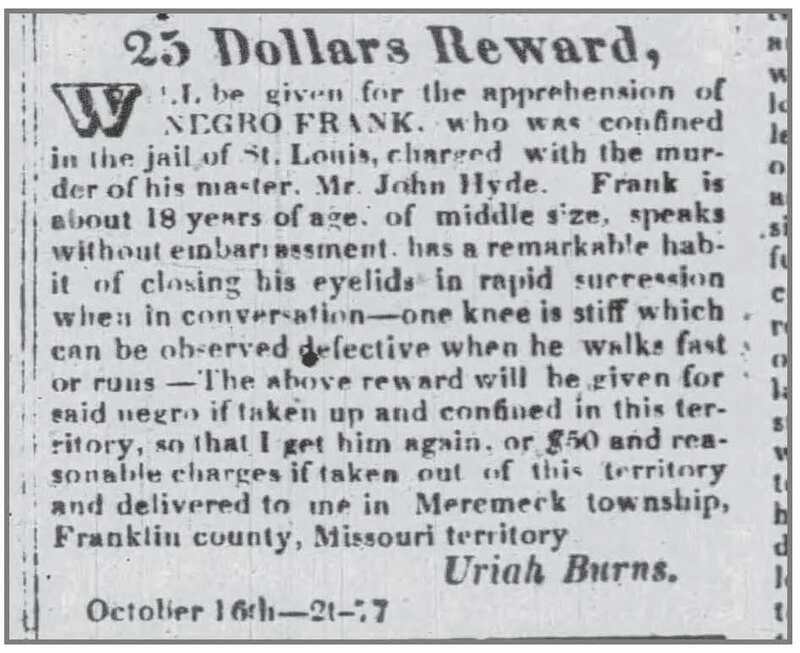 By the time the case wound its way to the North Carolina State Supreme Court in 1820, John Hyde had already packed off for Missouri with its prospect of cheaper, better land for his large family. From this point on, the case seems to have disappeared from the papers. 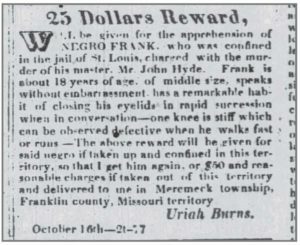 We can only hope that this young man Frank, who spoke without embarrassment, eyelids fluttering, made his final escape from slavery. This is where the unmarked graves of enslaved Africans/Americans are. I hope to add a marker in this area. This is a listing of poeple enslaved* by the Avery-family. I’ve divided them into family groupings. I hope it will help their descendants in their searches for their family history. I’ve also added a brief history of the Avery family to help put these enslaved Africans and Americans in a wider historical context and timeline. *A note on the terms I’m using. Race and racial slavery are such painful and difficult issues in our collective history that I am trying to do my small part by reexamining even the terms used to discuss it. The words we use reflect our beliefs; using different words can undermine those beliefs. So, for instance, rather than calling the people on this list “slaves,” they are “the enslaved” – which describes what was done to them but does not define them by it. And it places culpability squarely where it belongs – on those people like my ancestors who engaged in the enslavement of other human beings. I also use the term “racial slavery” for slavery as it was practiced in the U.S. Slavery, of course, has been practiced, and practiced in different ways, throughout human history. 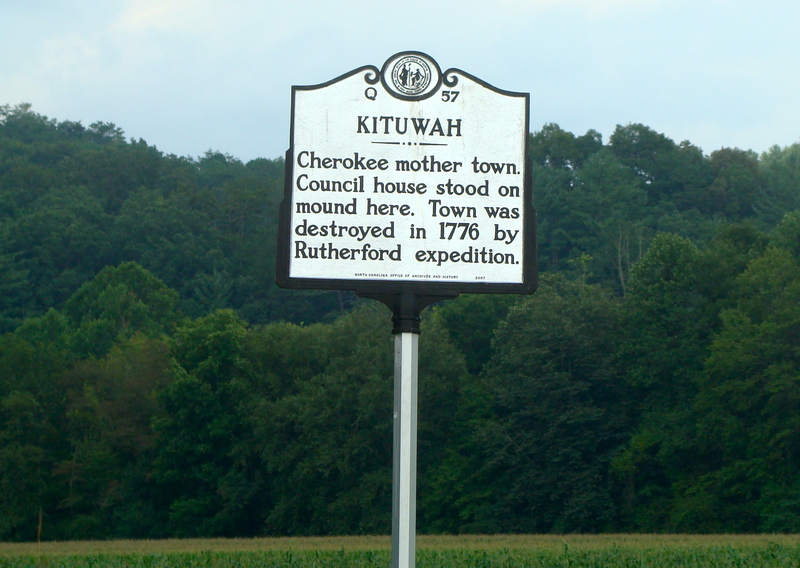 The Cherokee took those defeated in battle as slaves, but then often eventually adopted them into the family with full familial rights. Slavery as practiced by whites in the U.S. was an institutionalized system of degrading, devaluing, and using people of African descent. Our economy was built on it and an entire field of pseudo-science was created to justify it (e.g. different races were believed to be different species). Waightstill Avery, who founded the Swan Ponds plantation (I don’t say he “built” it because, of course, it was built by enslaved people), was born in 1741 in Groton, Connecticut. He was educated at Princeton University. In 1778, in New Bern, NC (on the east coast) he married a young wealthy widow, Leah Probart Franks. 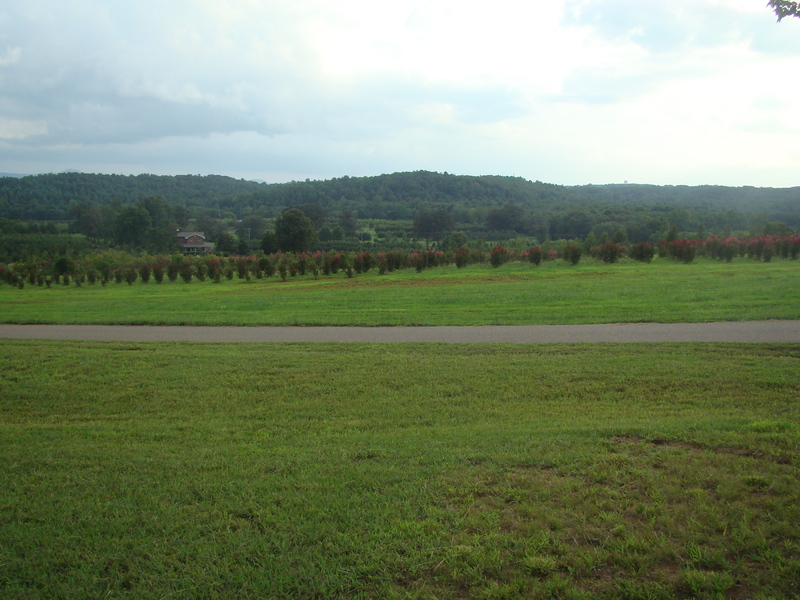 After a few years in eastern N.C., Waightstill and Leah moved to Burke County, N.C. in the foothills of the Appalachian mountains in western N.C. Swan Ponds plantation, just outside Morganton, was established. They had four children – Polly Mira Avery, Elizabeth Avery, Isaac Thomas Avery, and Selina Louise Avery. Leah and Waightstill lived at Swan Ponds until their respective deaths. Waightstill Avery died in 1821 and Leah died in 1832. Their son, Isaac Thomas Avery (1785-1864), inherited the plantation and some portion of the enslaved population. In 1815 he married Harriet Eloise Erwin (1795-1858). The Erwins were a wealthy local family. They owned a plantation called Belvidere and, presumably, some of those enslaved by the Erwins went with Harriet to Swan Ponds. 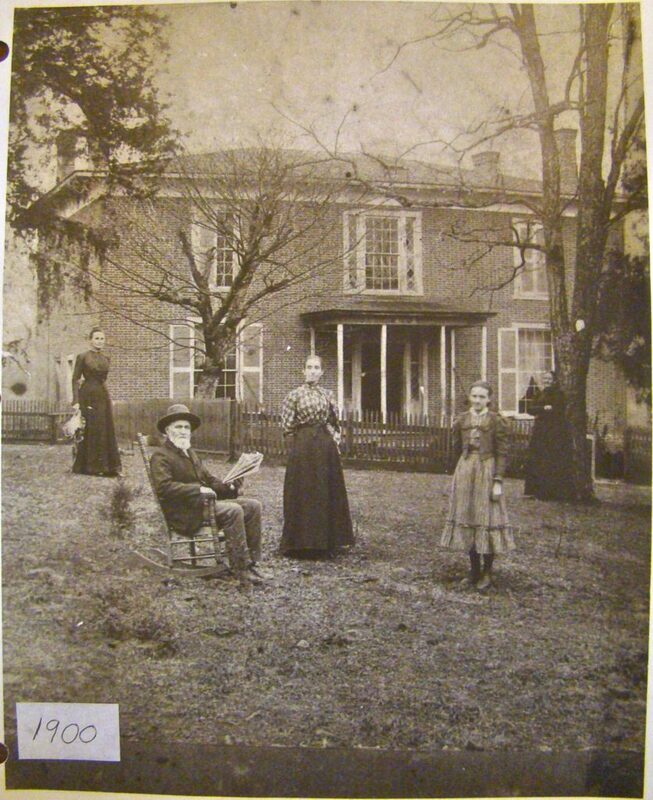 They had ten children (that survived into adulthood): William Waightstill Avery, Isaac Erwin Avery, Mary Martha Avery, Justina Harriet Avery, Alphonso Calhoun Avery, Laura Myra Avery, Willoughby Francis Avery. Three of their sons – William Waightstill Avery, Clark Moulton Avery, Isaac Erwin Avery – died in the Civil War, fighting on the wrong side of history. Their father died in 1864 after hearing of the deaths of William and Clark. After emancipation, many of those who had been enslaved (having few options) stayed in the area. There are still many Avery descendants, both black and white, in the area around Morganton. The people the Avery family enslaved (and who died before emancipation) are buried in unmarked graves near the small Avery family cemetery. I hope to raise enough money to put a permanent marker of some kind near or on the place where these enslave people lie, and on it all their names. 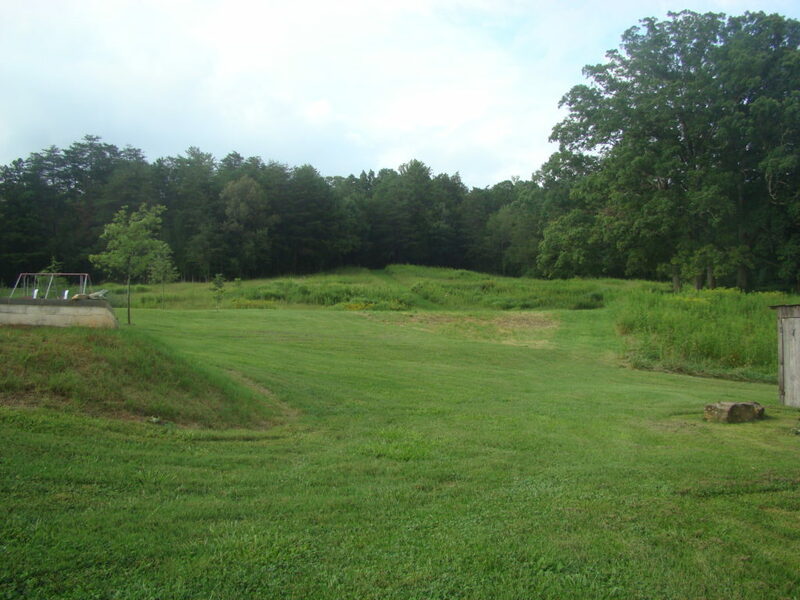 Slave cabins were on this ridge along the tree line. Swan Ponds in 1900, more or less as it would have been during the time of slavery. [Same Diana? Son Cyrus, b. 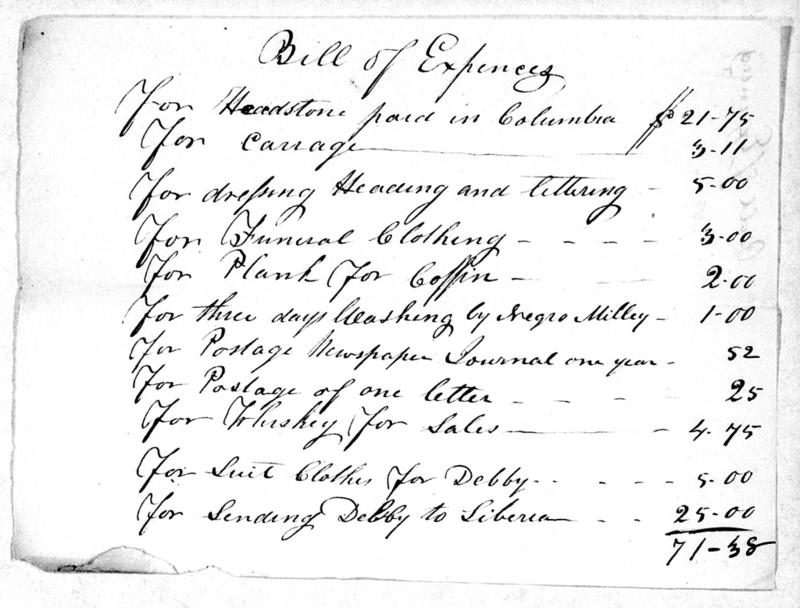 10 Jan. 1838 “bought by Forney and paid.”]? Son Clingman August 2, 1855? Son Elisha, b. August 26 , 1855?